An extra set of consumable Student Pages from The Story of the World Vol. 4: The Modern Age, Activity Book. The Activity Book already contains one set of Student Pages. If you need additional Student Pages for use in your family, you’re free to make copies from the Activity Book. 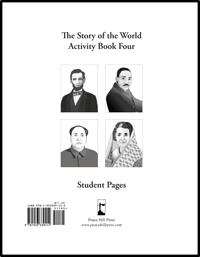 Many parents find it easier to skip the photocopier and simply purchase this additional set of Volume 4 Student Pages instead. You can get this product as a handy downloadable PDF, so that you can reprint them again, and again, and again…(to make even more paper versions of the Crystal Palace.) Or you can choose a shrink-wrapped packet of loose-leaf papers that are 3-hole-punched and ready to go into any standard three-ring binder. The instructions for the parent or teacher are NOT included in these Student Pages. Those instructions (and a lot more!) can only be found in the Activity Book. Did you know that, although the Volume 4 Activity Book doesn’t have coloring pages (since it was designed for slightly older students), we have a pack of nothing but coloring pages to accompany it? Does the loose leaf packet include the coloring pages the ones that aren’t in the book)? I bought the activity book for the very reason that I liked letting my kids color the activity pages while I read to them so I was a little disappointed that they weren’t included in the book. The link to preview doesn’t work. Is there another way to preview what the activity pages are like? Sorry about that! We have corrected the “Sample” link, and it should work for you now. Please try again. Does the student pack include the outline pages? Are the timeline piece pages included in the student sheets? Are the directions for the maps included with this? It would really be helpful to have a PDF of just the map directions similar to the PDF of the comprehension questions. Using the activity book for the student is cumbersome. The directions are not currently included with these student pages. Thanks for the suggestion, though: that is something we are looking at doing, and it’s helpful to know what is useful (or not) to the customers. A physical timeline is not included, although each of the figures/cards contains the date when the event took place.